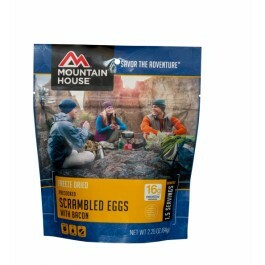 Eggs with bacon from Mountain House comes in a convenient pouch which contains 1.5 servings, each of which are ¾ of a cup. This is an excellent addition to any emergency food storage program. 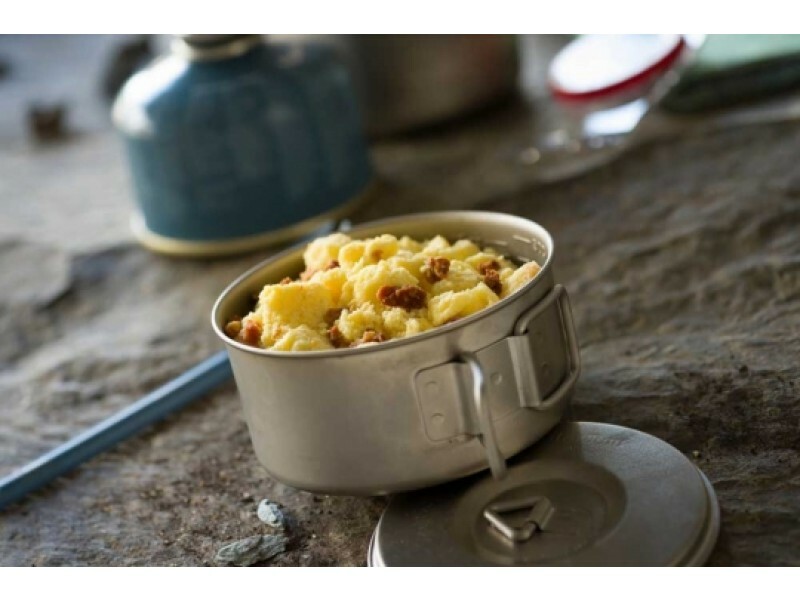 Many people will bring a pouch or two of this high quality food with them when they are going out for a hike or camping. This will help ensure they always have enough food to get through anything they happen to run into. Buy one pouch, or stock up on them, so you have delicious eggs with bacon no matter what type of situation you’re faced with. 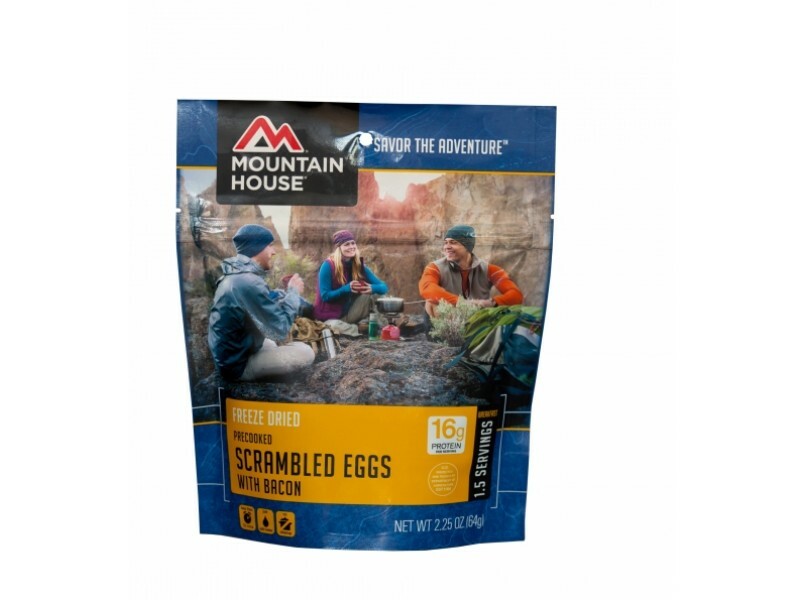 Mountain House eggs with bacon is a popular breakfast food that not only tastes great, but also lasts a long time on the shelf. The shelf life is a minimum of 10 years, and depending on the area it is stored in, it can last much longer than that. 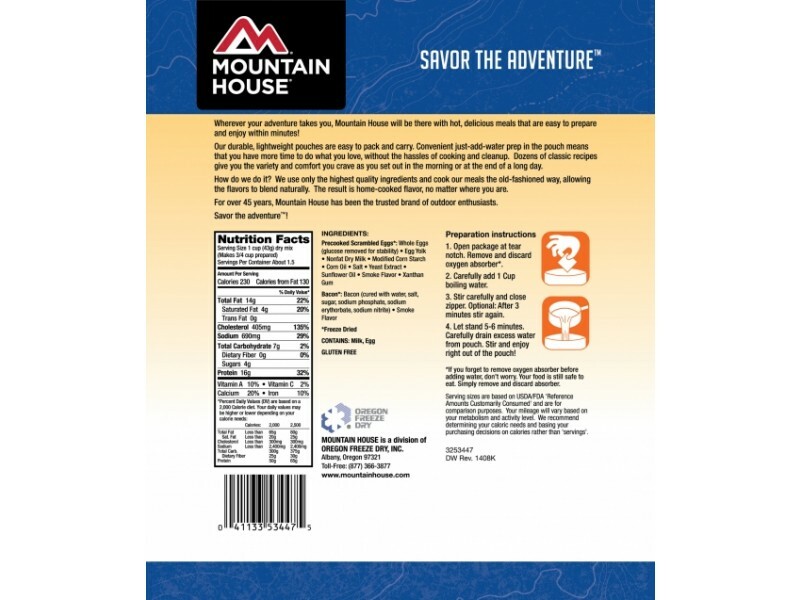 Each pouch contains 1.5 servings of this high quality, freeze dried food that everyone will love. Preparing this meal is also extremely simple, requiring that you just add in the recommended amount of hot water, and wait for a few minutes for it to heat up. One of the best things about having eggs and bacon available during an emergency or disaster is that it is such a healthy meal for these situations. Each serving contains 17 grams of protein, which is extremely important for staying strong during difficult times. They also have 210 calories, 13 grams of fat, and a wide range of different vitamins and minerals. No matter what you plan on using these eggs with bacon for, you’ll be glad you have them available. If you purchase multiple pouches, you can easily stock them away into your pantry or any other area so they won’t be in the way. This is one of the most convenient emergency food storage foods on the market today. INGREDIENTS: Freeze Dried Precooked Scrambled Eggs: (whole eggs, egg yolks, nonfat dry milk, modified corn starch, corn oil, salt, yeast extact, sunflower oil and smoke flavor, xanthan gum). Freeze Dried Bacon: Bacon (cured with water, salt, sugar, sodium phosphate, sodium erythorbate, sodium nitrite, and smoke flavor) CONTAINS: Eggs, Milk. One pouch contains 1.5 3/4 cup servings.